If it hadn’t been for a host of frustrating injuries, Russell Dickson might well have become a household name at Collingwood. An opportunistic, talented forward who would have instead preferred to have broken into the Magpies’ midfield, Dickson had an uncanny knack for slotting through goals. He kicked four on VFL debut in a particularly noteworthy match in Round 1, 1985, and by the end of his 13th game in black and white had kicked four goals on three occasions. It seemed Collingwood had found the clever small forward it always craved. But he played only seven more games beyond that, kicking a solitary goal in the process, as he fought a constant battle with his body before returning to his suburban club. Dickson was born and bred in one of Collingwood’s northern strongholds – Greensborough – where his parents helped to establish the junior football club in the Diamond Valley Football League. He was a junior star then, and teammates still recall his freakish talents, especially the exquisite skills on both sides of his body. It was no surprise when his performances pricked the interest of the Magpies, though Dickson was initially reluctant to take up the offer. Having played that one season against men, Dickson decided to head to Victoria Park the following year and had two seasons playing predominantly in the reserves, despite being eligible for the under 19s. 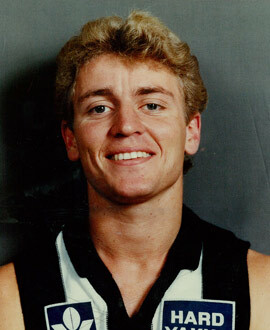 He would suggest later he was fortunate to still be on the Magpies’ list after his 1983-‘84 seasons in the reserves. It worked, too, as Dickson won his way into the opening game of the 1985 season (the historic first Victorian Friday night game). Bob Rose and John Kennedy made their coaching comebacks that night, while Brian Taylor played his first game for the Magpies, kicking seven goals and earning three Brownlow Medal votes. Incredibly, 21-year-old Dickson, in his debut game, was handed the two votes, for four goals in his maiden match. Dickson didn’t feature prominently in the first half but kicked consecutive goals in the third term and then backed up with two more late majors for a brilliant debut, ending with 4.1 and 12 disposals in the Magpies’ 38-point win. The following Tuesday, he played in a mid-week night match where he kicked two more goals, and once again featured as one of the club’s best players, his blonde hair and dashing style quickly earning comparisons with the mercurial Mike Richardson. At the time, though, Dickson was trying to model his game on the far less flashy Tony Shaw, not Richardson. Midfield was where he wanted to be. But with Shaw, Richardson, Geoff Raines, Mark Williams and others ahead of him in the queue, opportunities were limited. He finished that first season with 11 matches and nine goals, his output having diminished as the year wore on. But back-to-back hauls of four goals against Footscray (you can check out his goals in a highlights package on YouTube) and Melbourne in Rounds 5 and 6 in 1986 once again highlighted his capacity to hit the scoreboard. This, however, was when the injuries really started to kick in. He had a handful of hamstrings and a nasty broken wrist in what proved to be his last game against the Eagles. He managed only six games in 1986 and three more in 1987, taking his VFL tally to 20 games and 18 goals. He went back to Greensborough in 1988, harbouring a dream of having one more crack at the VFL in the future. That ended with a broken jaw in the rough and tumble of the Diamond Valley league. Dickson’s VFL career was over, but his connection to his childhood club proved to be far more enduring. He would go on to a play a significant role with Greensborough, as a player and later a coach. He would win two best and fairest awards and end up in the club’s team of the century. His time in black and white was relatively brief, but his initial impact was significant, and his connection to the game at his local club endures off-field to this day.